The State Police Command in Akwa Ibom has arrested a 30-year old woman identified as Peace Chukwuemeka, for stealing a month-old baby from her mother. It was alleged that Chukwuemeka drugged the mother of the baby before stealing the child. The state Police Commissioner, Mr. Murtala Mani, said this while speaking with journalists on the activities of the command in Uyo on Tuesday. “Let us say clearly that in the month of November, the Acid Section through the Family Unit of the Nigeria Police Force in Akwa Ibom was able to record a great feat by bringing back a one-month-and-some-few-days-old baby to her mother in Akwa Ibom. “The suspected woman, who has been married for some years without giving birth to a baby, left Lagos State for Uyo, stayed in a compound in Mbak Itam with the intention to steal a baby from her neighbor. “The Family Unit of the command, through intelligence report, was able to rescue the baby,” Mani said. Mani added that the police also rescued a four-year-old boy from a young man, who snatched him from his mother at gun point. 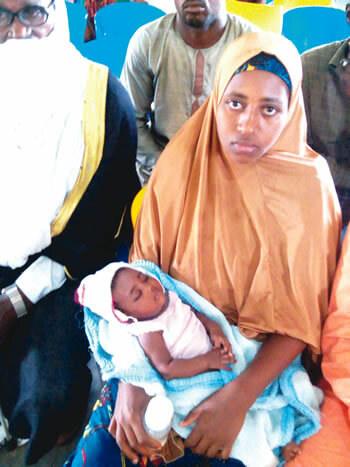 Confessing to the crime, Peace Chukwuemeka, said she had married for 10 years without giving birth to a child and had been desperate to have a baby. She, however, denied drugging the mother of the baby. “I did not give anything to the mother; it was a coincidence that she was asleep and seized that opportunity to take the baby. “I have been married for 10 years now, so I need a baby of my own. I took the baby to my mother in the village but she refused to collect her from me. I came back to Akwa Ibom and the mother of the baby started asking me of her baby and I was arrested,” Chukwuemeka confessed.